Thousands of students across the country will come together again this week to rally against school gun violence -- an event the teenage organizers hope will empower students to continue their momentum in a push for common-sense gun reform. 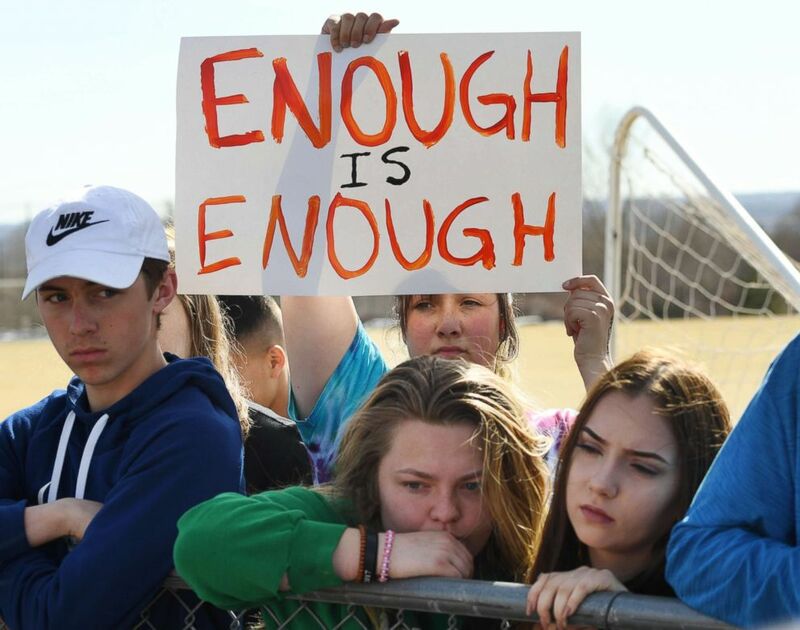 The event -- called the National School Walkout -- focuses on high schools and will take place on April 20, the anniversary of the massacre at Columbine High School in Colorado, where two students opened fire in 1999, killing 12 of their fellow students and a teacher. The event was organized by 16-year-old Lane Murdock, a sophomore at Ridgefield High School in Connecticut, along with three of her classmates. More than 2,000 events are registered across the country, with at least one in every state and several globally, according to the organizers. The walkout begins at 10 a.m. in each local time zone. When students head outside, they will first take part in 13 seconds of silence to honor the 13 people killed at Columbine High School. 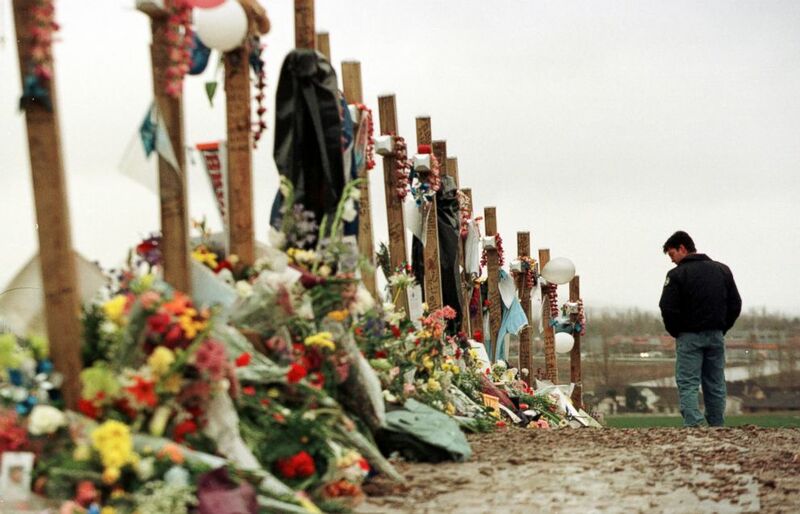 Ryan Foreman of Denver's South Metro Fire Department, visits a memorial for the victims of Columbine High School tragedy in Clement Park, April 30, 1999. Then the format of the walkout is up to each school. Lane told ABC News she proposes that schools incorporate open mics, guest speakers and voter registration. She said some students plan to write letters to those in communities impacted by school shootings. This is a problem that needs to be addressed longer than 17 minutes. But this event differs in one major way from last month's nationwide school walkout, which was held on March 14, one month after the shooting at Florida's Marjory Stoneman Douglas High School that killed 17 students and staff. 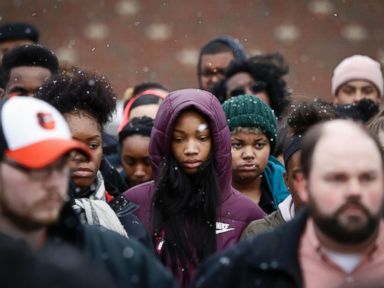 The March 14 walkout officially lasted for 17 minutes to mark the 17 lives lost. After the 17 minutes, many students returned to their classrooms. 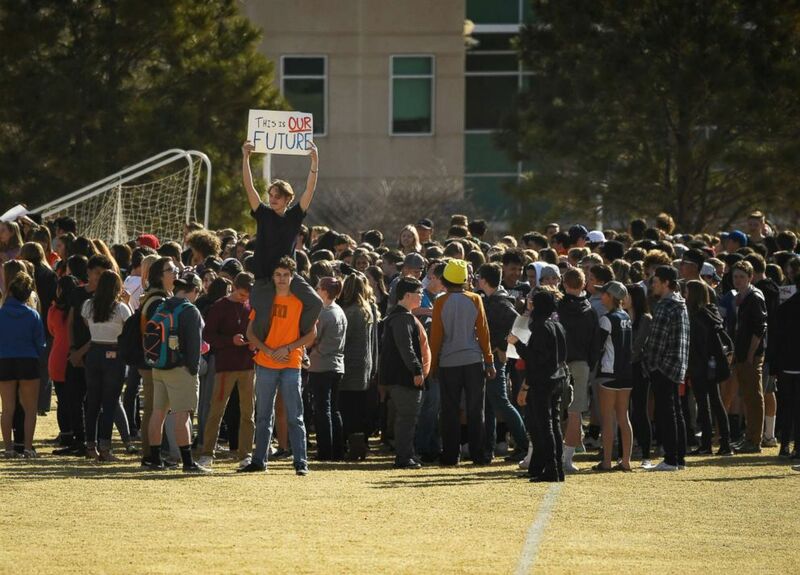 Students at Columbine High School walk out of classes in protest of gun violence for 17 minutes, one minute for each Florida high school shooting victim, March 14, 2018 in Littleton, Colo.
Leah Zundel, 15, a student at Columbine High School, holds a sign that reads "Enough is Enough" as she and other students walked out of classes in protest of gun violence for 17 minutes, March 14, 2018 in Littleton, Colo. The April 20 walkout, meanwhile, is set to last from 10 a.m. until the end of the school day. "This is a problem that needs to be addressed longer than 17 minutes," Lane explained. "As a student who can't vote, you don't have a lot of power. But what you have that's powerful is your voice, your thoughts, but also your attendance. And leaving for longer than 17 minutes, leaving and breaking up that schedule that all American students have every day is how you get people to pay attention," Lane said. 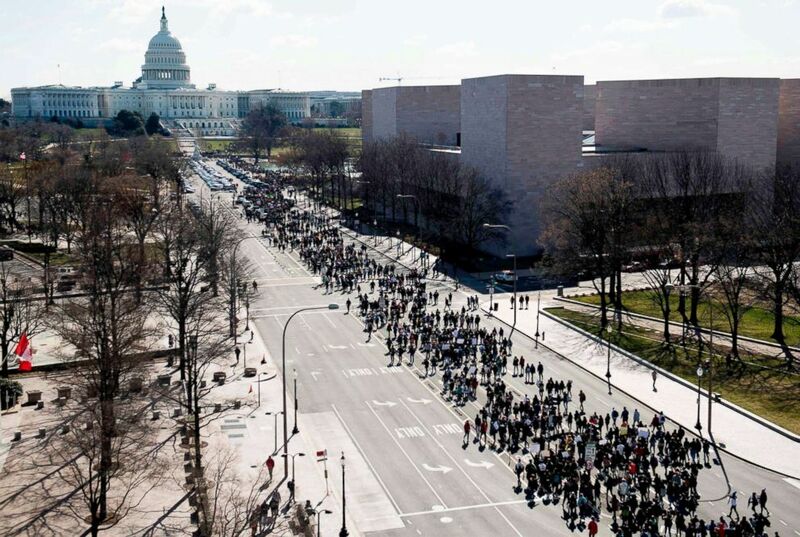 Thousands of local students march down Pennsylvania Avenue to the U.S. Capitol during a nationwide student walkout for gun control in Washington, D.C., on March 14, 2018. Lane said the walkout comes as a direct response to the Stoneman Douglas massacre, because her first reaction to the February shooting was numbness. 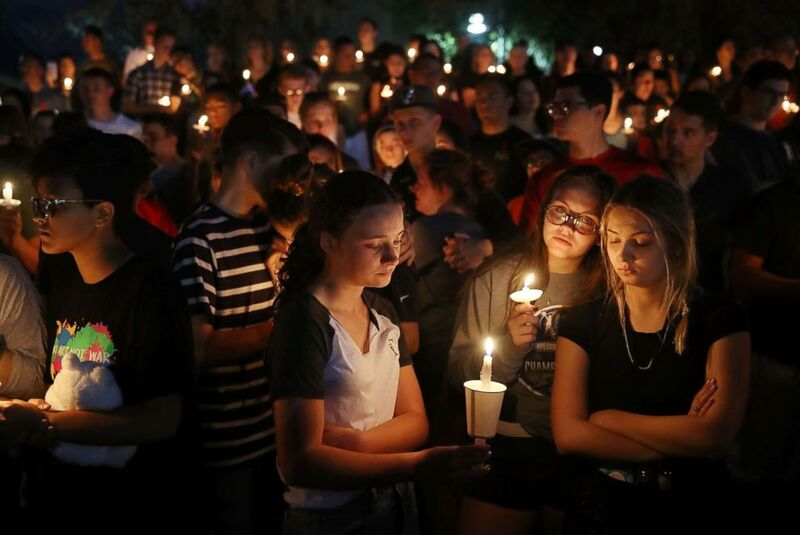 People attend a candle light memorial service for the victims of the shooting at Marjory Stoneman Douglas High School , Feb. 15, 2018 in Parkland, Fla.
"We live in a kind of desensitized country" when it comes to school shootings, she said. "After reflecting on my own lack of emotion, seeing how wrong our country is, the fact that this keeps on happening... I felt so helpless.... I knew I needed to do something." "I started to think to myself, 'What can I do to change the narrative?'" Lane said. "But also, 'What can I do to give people who maybe don't have as much time on their hands as I do, to give them that power?'" Three of Lane's classmates are leading the National School Walkout with her, including Grant Yaun, a 17-year-old junior. Grant said he was an 11-year-old sixth grader at the time of the December 2012 Sandy Hook Elementary School massacre in Newtown, Connecticut, which is near Ridgefield. That shooting, which killed 20 children and six teachers, was the first time he said he was aware of the realities of school violence and "how disturbing these kinds of things were." 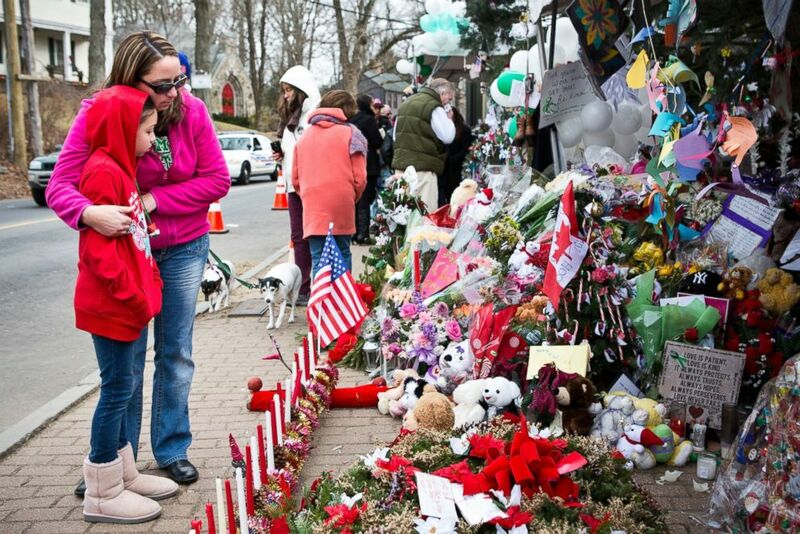 Deborah Gibelli holds her daughter, Alexandra Gibelli, age 9, while looking at a memorial for those killed in the school shooting at Sandy Hook Elementary School, on Dec. 24, 2012 in Newtown, Conn. But in the six years since then, Grant said, the "onslaught of shootings" has made him more desensitized, so he also didn't have a strong first reaction to the Stoneman Douglas shooting. But "after some reflection," he said, he felt "it was time for something to change." We're not going to be silenced or ignored. Lane and Grant said they hope the walkout will build momentum for common sense gun reform, like bump stock bans and universal background checks. They also want the event to empower students across the country and increase the turnout of young voters at the November midterm elections. "The walkout is an event designed to create friction, put some energy into the discussion and it's almost a show of force," Grant told ABC News. "We're not going to be silenced or ignored." Students participate in a march in support of the National School Walkout in Queens, New York, March 14, 2018. 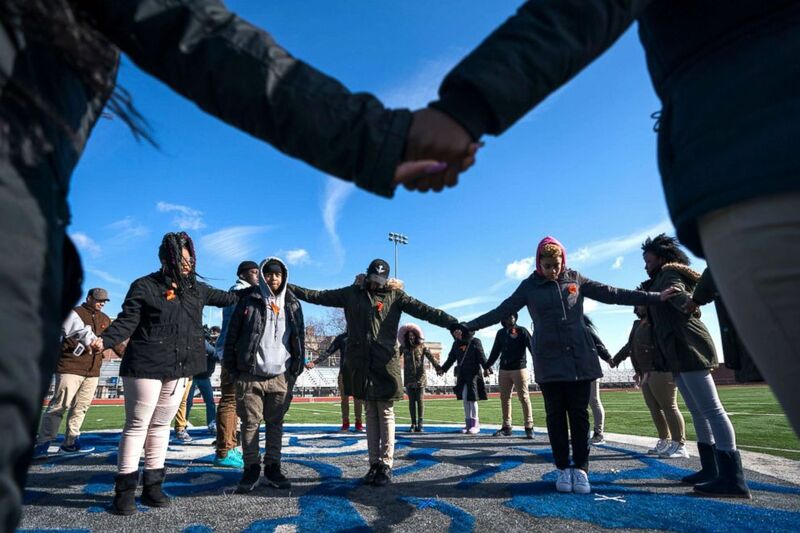 Eastern High School students walk out of class and assemble on their football field for the National School Walkout, a nation-wide protest against gun violence, in Washington, on March 14, 2018. Grant said the "overall reception" from school administrators across the country to their nearly all-day walkout "is relatively neutral or positive." "Resistance does exist," he said, but "thankfully it seems at least the majority -- however slim the majority may be -- of schools are at least friendly to the event or have accepted it's going to happen whether they sanction it or not, and have made moves to accommodate." In Maryland, Washington County Public Schools Superintendent Boyd Michael said at a listening session this month that students would be considered truant if they walk out, according to the Herald-Mail Media, the website for the local Herald-Mail newspaper and HMTV6 cable news channel. But Michael added that "discipline would vary depending on students' specific actions," the Herald-Mail Media reported. "We'll continue to work with student government and students," Michael said at the listening session, according to Herald-Mail Media. "We want them to share their ideas and their concerns with us, but we can't have a situation where we're disrupting the natural school flow or the natural school environment." He didn't immediately respond to ABC News' request for comment. But to the student organizers, disrupting the school day is an important part of the walkout. This walkout isn't the end -- it's kind of a start. "When you get rid of the routine you show them this is a cause that we care about, we're changing how were doing things and voicing our opinions," Lane said. "This will not be a day off," Lane continued, stressing that students worked hard to organize these walkouts for their communities. "This is something [organizers and participants] should be proud of because they are putting themselves in the narrative and they are changing it to one that is proactive." Added Grant: "This walkout isn't the end -- it's kind of a start, actually. We've rolled out a chapter-based organization to capture the momentum of the walkout, to capture that raw energy as it kind of reaches this peak. And focus it and allow it to carry the movement on until November [midterm elections]." Lane and Grant said these chapters -- of which there are already 150 -- hand over the control to students across the U.S. who know their communities. 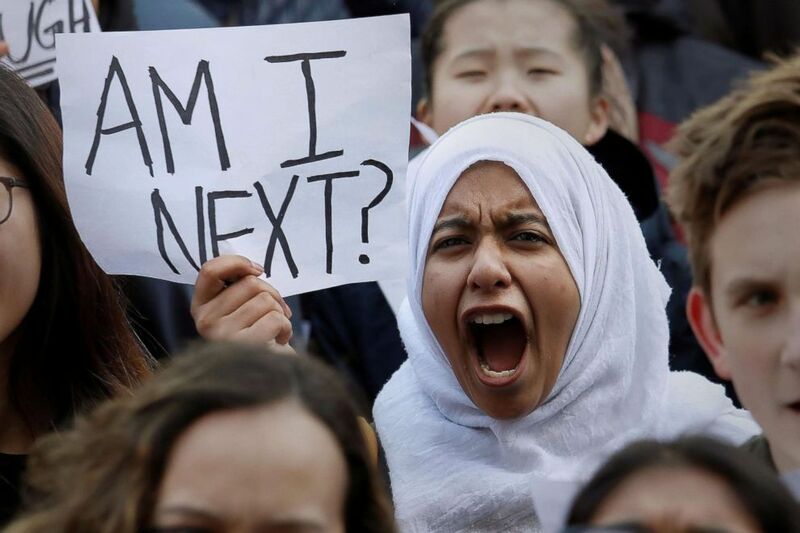 "Students enrolled in their local chapters will plan the walkouts and follow through with the walkouts and then transition into a school club type organization -- not necessarily sanctioned by the school," Grant said. "Then the chapter-based organizations will meet regulatory to: A. Get young people who are eligible to vote [by this November] registered. And B. Get young people interested in politics and remove any sense of fear or apprehension from it, or just general confusion, and to raise political awareness." Grant, who will be too young to vote this November, admitted that does create some frustration, but he added, "I feel I'll have done more than a single vote for myself ever could just by helping organize this."